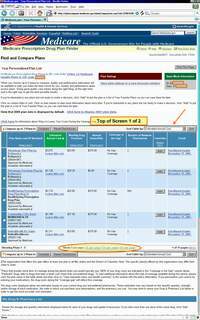 Looking for a guide to using the Medicare.gov Medicare Part D prescription drug finder tool? 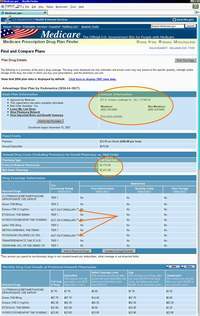 We have put together a short summary that may help you find your way through the Medicare.gov Medicare Part D selection tool. 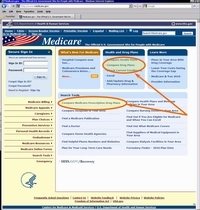 Below, you will find an overview of each page that leads you through the Centers for Medicare and Medicaid Services (CMS) rather complex web tool. If you have questions, please let us know - our contact form is located under the Customer Help Desk. Please note that "Jump to" links to each tutorial page are provided under each graphic. 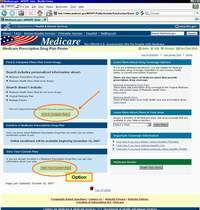 You will find that the Medicare.gov home or start page provides you with more than one place to start with the Medicare Part D plan finder. 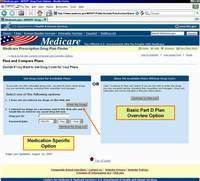 You can select either the Medicare.gov menu item entitled: "Medicare Prescription Drug Plans - 2008 Plan Data" or you can begin with the link further down the home page entitled" Compare Medicare Prescription Drug Plans". 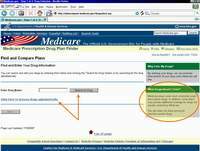 If you find that you wish to see Medicare Advantage (MA) plans along with the Medicare Part D prescription drug plans, the Medicare.gov gives you a few opportunities as you work through their system. Remember not to get the two plans confused. Medicare Part D plans only provide prescription drug coverage. Medicare Advantage plans provide Medicare Part A (Hospitalization) and Medicare B (Physician Services) - and may also include a prescription drug benefit. Bottom Line: Do not rush through the website. On this screen we discuss the difference between "Begin Personalized Search" and "Begin General Search." Here we discuss the various questions asked by Medicare prior to starting a search and the affect that your answers can have on your search. 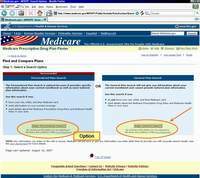 This page show the outcome of Medicare's current plan summary, which was based on your input to their questions in the prior section. 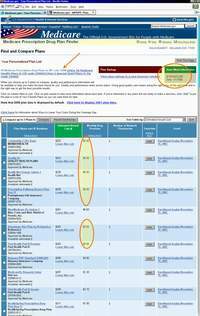 This page shows how to start a new plan comparison and how one returns to a previous saved plan comparison. This is where the fun starts! How to find your medications and put them in your drug list! This page discusses how the dosage and quantity feature works. It is quite flexible and your entries will determine the accuracy of your plan comparison. Tips are given. 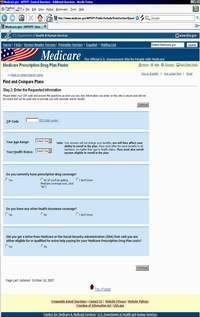 How exactly does one go about saving a drug list for future use? Its easy. Shows how to make your plan comparison dependent on only those pharmacies that you prefer. We are finally there! The plan comparison summary. 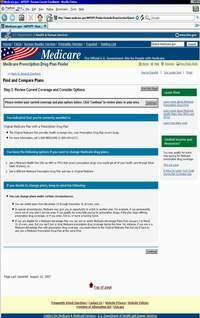 This page shows the projected annual costs for each plan and it also details your drug list so that you can make changes if necessary. How to compare any three plans in detail. The various sections of the detailed plan comparison are explained. How can you see even more detail about a particular plan? We show you here. 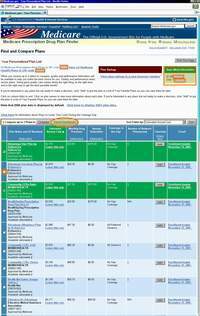 How can you get a medication based plan comparison even if you do not know your medications? Look here. 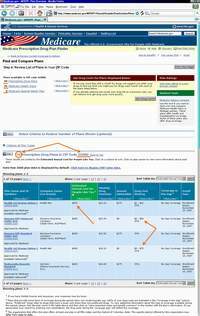 How does an plan comparison for someone who has a "full" Low Income Subsidy (LIS)? See details here. 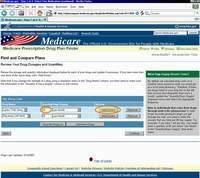 Here is an overview showing the complex Medicare.gov Part D Plan Finder System. Please notice that some screens or areas handle more than one decision. Also, some parts of the Plan Finder allow a user to go back and change information However, other parts of the Plan Finder do not permit someone to change information once it is saved. For instance, if you entered all of your prescription drugs and dosages and then received a letter about qualifying for Extra Help, you would need to start again, change your Extra Help status and re-enter all of your medication information. The Big Picture can be found by using the link below.